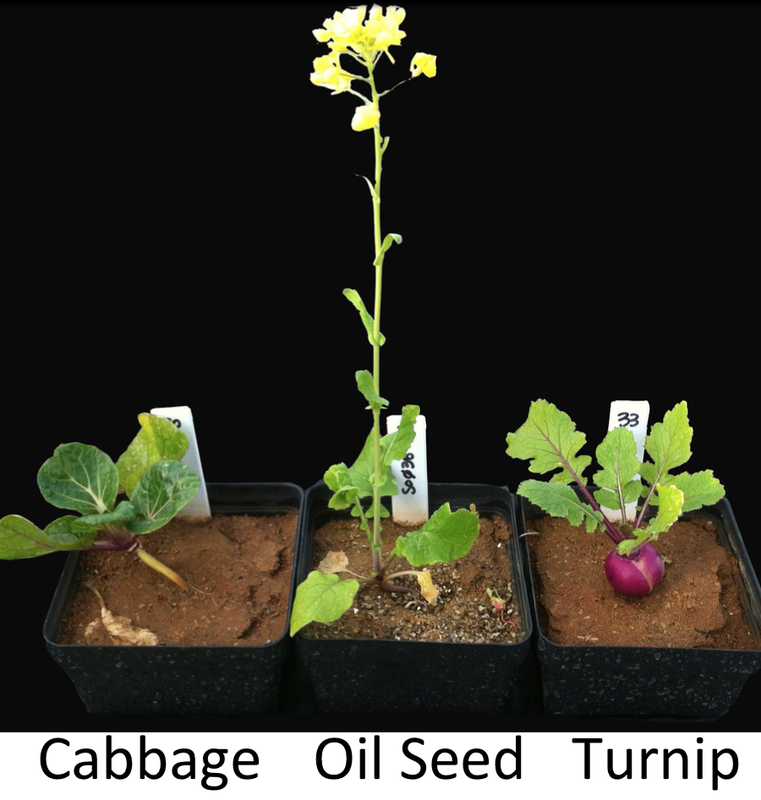 The three major crop types of Brassica rapa have been artificially selected for drastically different patterns of allocation, morphological and life history differentiation, and concomitantly different physiological and anatomical properties. 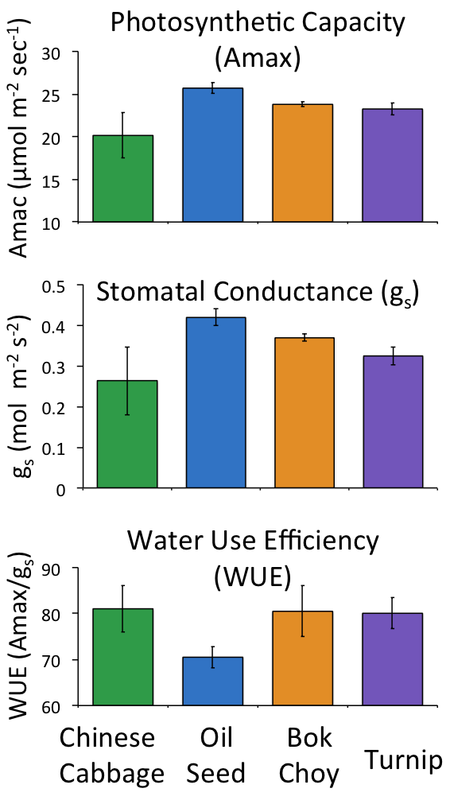 Stomatal conductance (gaseous water loss), hydraulic conductance (liquid water loss) and resource partitioning to roots, leaves and seeds are components of water-use efficiency (WUE, the amount of carbon fixed per unit of water transpired), and WUE is a critical determinant of crop yield. Understanding the genetic basis of anatomical and physiological changes that improve crop WUE is relevant globally as human population growth places increasing pressure on available water. Global and regional precipitation and future water supplies are also increasingly unpredictable as a consequence of climate change. In particular, climate model simulations project precipitation decreases in some sub-tropical and lower mid-latitude regions, including much of the western United States. Measurements from 250 accessions of B. rapa demonstrate clear physiological differences between crop types (F(11, 612) =2.16, p=0.015). I investigate the genetic architecture of leaf anatomy and the relationship between organ-level anatomical features and both leaf-level gas-exchange and whole-plant allocation in diverse cultivars of Brassica rapa. Historically, there are three geographic centers of B. rapa cultivation (Europe, India, and Asia), each including two or more distinct crop types – brocolettos, vegetable turnips, cabbages, and seed oils. B. rapa is an excellent model to link anatomy to WUE patterns, because different organs are targeted for harvest among crop types and crop types exhibit characteristic differences in leaf-level water use and allocation (Yarkhunova et al., in review). I collect anatomical data through thin sections and confocal microscopy and develop single nucleotide polymorphism (SNP) markers through next-generation sequencing. These data serve two purposes, the first being to robustly characterize genetic and phenotypic distances among B. rapa crop types and the second being genome-wide association analysis. I calculate genetic distances, which estimate genome-wide similarity among accessions experiencing parallel selection during domestication. I test the genetic distance matrices for correlations with phenotypic matrices of leaf structure to ascertain what anatomical features may contribute to observed differences in photosynthesis and conductance among crop types. I use Principal Components Analyses (PCA) to identify the main axes of genomic variation and test for associations between individual PCAs and both crop type and geographic origin. Using GWAS, I will catalogue specific genomic regions affecting anatomical phenotypes of interest.